You can make pivot tables much easier to use by combining all of the aggregator columns into a single table, using the RELATED function. This blog also shows you how to work with blanks, including using the ISBLANK function to test whether matching values exist in linked tables. 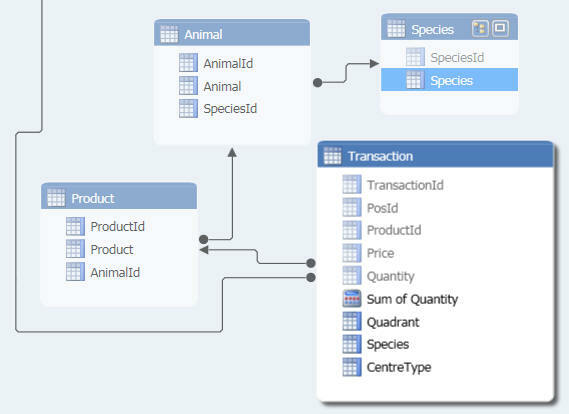 We can show the species name field in the transactions table because there is a link between them (you can hop relationships from transaction to product to animal to species). 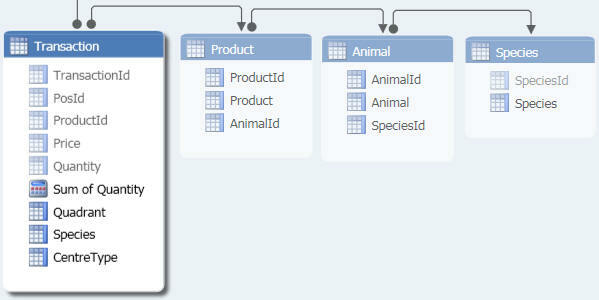 Each species has lots of animals, each animal has lots of products and each product has lots of transactions. A good way to think about this is: if I use RELATED to show a field in a particular table, will SSAS Tabular have a unique value to show in every case? Start the formula by typing =RELATED(. 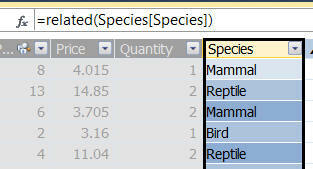 Click on the Species table, then on the SpeciesName column within this. Here I've renamed the column also. You can now repeat this to bring in the quadrant and centre type names.